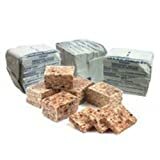 Datrex emergency rations, the gold standard of food and water rations, are individually wrapped highly concentrated food bars which are then vacuum bagged in a specially designed polymer-foil package. This high level of protection is certified to keep the contents fresh for a minimum of five years in even the harshest environments. Get the best, you or your family’s lives could depend on it! Baked and packaged in America at FDA certified facilities.